Use wet or dry, day and night for beautiful, natural eyes. Ere Perez Natural Cosmetics has added to its beautiful natural beauty regime with nine gorgeous eye colour duos made from finely milled rice powder and enriched with chamomile to create the softest, kindest and most naturally beautiful eyes on earth! They come in nine shade duos - each with a matt and a shimmer side to give day and night options. Even better, they're not only natural, but can also be used wet or dry and are totally waterproof, vegan, there are not tested on animals and are approved by "cruelty free"! The philosophy behind them is that they provide a basic colour palette - an essential, subtle and natural eye wardrobe everyone should have in their makeup drawer to create all the classic and natural looks - day and night. 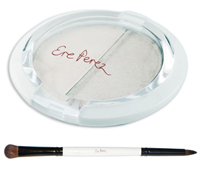 Ere Perez has also introduced a new Natural Line & Shade Eye Brush to go with the range of Natural Eye Colours. With a brush on each end, the new Line & Shade allows eye colour to be applied in a line with one end and then blended in with the other, for an easily achieved, professional look. The nine shades are also designed to provide a range to suit all eye colours and to match Ere Perez's Natural Lip Colours, Lip liner, Eye Pencils and Mascaras.